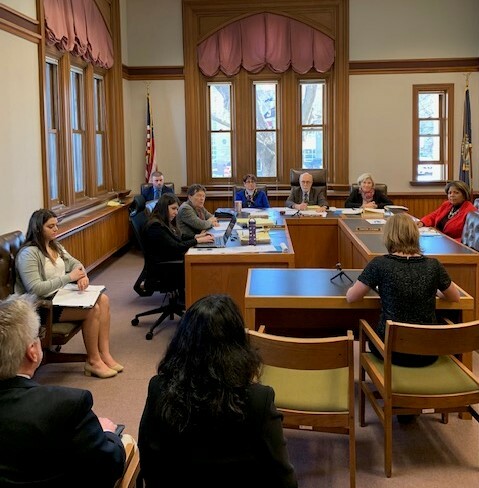 A standing room-only crowd filled LOB Room 103 in Concord on Tuesday as the Senate Transportation Committee heard public testimony in support of Senate Bill 241, which would allow the NH Dept. of Transportation to access existing federal funding to complete the critical Project Development Analysis of the NH Capitol Corridor Rail Expansion Project. Public support for the bill was unanimous! In addition to the testimony we provided on behalf of the 110+ bi-partisan New Hampshire businesses who comprise the NH Business for Rail Expansion coalition, Manchester Mayor Joyce Craig and Nashua Mayor Jim Donchess highlighted the economic benefit rail expansion would create along the corridor and their commitment to collaboration. The Greater Nashua Chamber of Commerce also expressed widespread support from their membership. Vincent Bono, president and CEO of Boston Surface Railroad Company was also on hand and testified in support for the bill as did state representatives. The Greater Manchester Chamber of Commerce, the New Hampshire Tech Alliance, Southern New Hampshire University, Eckman Construction, Northwestern Mutual and several others provided letters of support. Thank you to everyone that contacted the Senate Transportation Committee and has maintained support for this vital project.